The Kingdom of Bahrain is an archipelago made up of 33 islands located in the Arabian Gulf east of Saudi Arabia. Distinguished by a rich history that spans more than 5,000 years, this land has been home to illustrious civilizations like Dilmun, Tylos, and Awal. Known for its fresh water springs and palm tree fields, Bahrain has also often been referred to as the ‘Land of Immortality’ or ‘The Great Paradise’ - a place closely resembling the Garden of Eden, where death and sickness did not exist, and sweet waters flowed. The word ‘Bahrain’ means ‘two seas’ in Arabic, referring the point at which sweet-water under the sea merged with the saline water of the oyster beds, thus nurturing not just the finest of pearls but the reputation of Bahrain in the 16th Century, as the Gulf’s pre-eminent trade hub, and a sea transit point between the East and West. Drawn by the luster of the golden age of pearling in Bahrain (1850-1930), even the renowned French designer Jacques Cartier traveled all the way to the kingdom to buy what were considered gems more precious than diamonds. In 1932, Bahrain became the first Gulf state to strike oil which was discovered and operated by Bapco and years later also the first to diversify its revenue streams beyond oil. On December 16, 1961 when Shaikh Isa bin Salman Al Khalifa – a pioneering Arab leader, succeeded his father as the Emir of the land, it marked the start of the transformation of Bahrain into a modern nation and a key financial center in the region. In 1968, an agreement ended its status of being a British protectorate and by 1971, Bahrain gained independence with its first constitution being issued in 1973. With the ascendance of His Majesty King Hamad bin Isa Al Khalifa in 1999, Bahrain entered a new era of reform and development within a constitutional monarchy. His Majesty’s Economic Vision 2030 and the accompanying National Economic Strategy have ushered in a period of remarkable progress with a stable economy and increased effectiveness of Government institutions. The Kingdom has since made pioneering achievements in development, including winning the competition to host the Formula One Grand Prix on the Island. Today, Bahrain continues to steer through the twenty first century, diversifying its economy and nurturing international business relationships to become a model of modernity and stability in the region. Bahrain is also known to have the most competitive cost of living in the region (Numbeo survey). In addition, with no income tax on earnings gives an above average standard of living for expatriates who are known to save more here than in their home countries. Crime has rarely been an issue, thanks to a wise and stable leadership which has maintained a very tolerant stance throughout history. This island nation is known as a melting pot of different cultures and ethnicities, so one rarely feels alienated here. Bahrain is also perhaps the most progressive and liberal of the Arab states, while continuing to uphold its own traditions and culture, any expatriate would find it easy to respect and adapt to. Several places of worships are found around the Kingdom. Living in Bahrain as a single person means having greater flexibility in the choice of accommodation and better proximity to social spots. Based on an employee’s eligibility, Bapco provides shared or single accommodation in the Awali Township. Others have a choice of very modern ready-to-move-in condos and fully-furnished apartments available in central locations in Bahrain. A big concern for singles is often food, but with Bahrain’s explosive food scene, every cuisine is available suiting a variety of budgets or palette. Food is also largely affordable with clean street food being readily available around every corner. The many social and sports clubs in Bahrain will make sure that single expatriates soon get to make new friends, socialize and enjoy living. Warm in climate, compact in size and a distinctly easy-going culture, give Bahrain its rather easy pace of life which is very conducive to raising a family. Central to family life is one’s choice of accommodation which can be varied enough to suit one’s budget and unique enough to add value to one’s lifestyle. While Bapco provides eligible employees with family accommodation in the Awali Township, a wide variety of options are available to others. Properties are available as unfurnished, semi-furnished or fully furnished, depending upon a family’s needs, and ranges from apartments to villas, to properties within ‘compounds’. A compound is a gated and security-controlled premise with multiple houses (typically up to about 30 ), often centered around a communal area and facilities like a shared pool, children’s playground, tennis court, gym, etc. While some may find the weather of Bahrain too sunny, it also means lots of opportunities to enjoy the many outdoor and water activities found here: from horse riding, to jet skis, sailing, rugby, golf and diving tours, there’s enough and more for every family type to indulge in and make fun memories together. With a very vibrant restaurant scene, Bahrain is home to some of the finest eateries across cuisines, so needless to say, going out for a meal will be always something to look forward to as a family. Bahrain’s tourism ministry also supports events throughout the year catering to various interests and there is always something to look forward to. Click here for event listing. The Bahrain International Circuit, an ultra-modern motor sports facility is also a key attraction for the thrill-seeking families. Top brands vie for shelf space in the many well-designed shopping malls dotting the landscape of Bahrain and are well-frequented by locals and expats alike. These often serve as air-conditioned hangouts in the peak of summer and have an abundance of activities and entertainment for the young and old alike. Click here for a list of shopping malls in Bahrain. Uniquely positioned in the Gulf, Bahrain may be small in size but is big on culture with a deep-rooted history that is well-preserved and beautifully showcased thanks to the efforts of the Ministry of Culture. Shaikha Mai Bint Mohammed Al Khalifa chairs a special body under this Ministry called the Bahrain Authority for Culture and Antiquities (BACA) which works tirelessly to promote the Kingdom’s impressive rich culture by organizing annual festivals and cultural, intellectual and artistic activities locally as well as internationally. The Bahrain National Theater: With a 1,000 seating capacity, this theatre is the third biggest theatre in the Arab World. Inspired in its design by the fascinating tales of 1,001 Arabian Nights, the theatre opens as much of a wonderful world to its audiences by hosting numerous musicals, theatre and international performances. UNESCO World Heritage Sites: While 7 sites have been nominated under this category, only 2 have been approved as world heritage sites so far: The Pearling Sites and Qal’at-al-Bahrain better known as the Bahrain Fort. 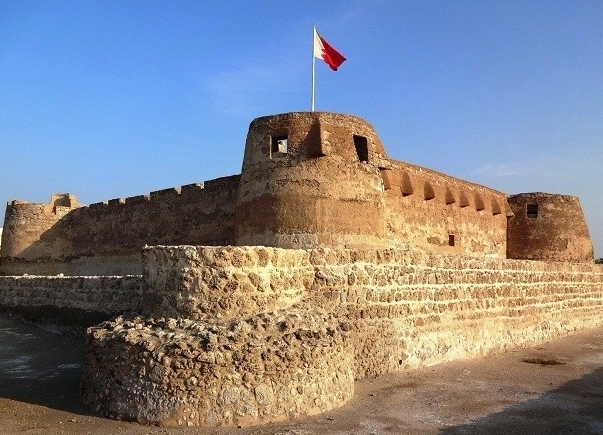 Bahrain Fort was supposedly the capital city of Dilmun, one of the oldest identified civilizations in the region. A walk beneath its archways is like having a first-hand interaction with its glorious past and is a must visit especially near sun down. The pearling sites are a long trail along the island of Muharraq famous for being the most prominent site for harvesting sea pearls from oyster beds. The trade literally shaped the island’s economy for a few centuries until the discovery of oil. Flanked by merchant homes and pearling workshops, the trail rounds off at the Qal’at Bu Mahir fortress and is a treasure waiting to be discovered. Bahrain’s social calendar is sprinkled with delightfully entertaining events catering to the whole family. A Sea Festival in October followed by a Light Show, to Food Festivals and Summer Shopping bonanzas, not to forget the much awaited Spring of Culture and Heritage festivals for the artistically inclined, all ensuring that there is plenty to keep you busy in Bahrain through the whole year. For further details please visit the Bahrain Authority for Culture and Antiquities website. Bahrain has a progressive and highly valued education system with public education being free. However, since the medium of instruction is Arabic, most non-Arab expatriate children attend one of the many private schools in the Kingdom. There is an abundance of schools to choose from, but since demand is quite high, places do fill up quickly, and there are waiting lists for new applicants, so it is recommended to start the application process as early as possible. Most nationalities will be able to find an international school following the curriculum of their home country helping maintain continuity in their child's education. There are several renowned British and American curriculum schools to choose from, as well as those offering curricula of India, France and Australia, while some even offer the International Baccalaureate program. Most of these schools are modern with a host of facilities that include extra-curricular activities and maintain high standards with smaller class sizes and a very good teacher to student ratio. For a more comprehensive list on the top schools in Bahrain please click here. Amongst all the Middle Eastern destinations Bahrain has become the preferred destination to live and work in, especially for those seeking a great work-life balance. However, moving to any new country can be challenging especially if you have a family in tow. But knowing that your new destination is Bahrain, makes it that much easier, simply because of the compact size of the country and the warm friendliness of its people. People mix: The current estimated population of Bahrain is 1.58 million, of which expatriates make for roughly half of that number. While most of the population is Middle Eastern, the country is home to a sizable population from India, Pakistan, Bangladesh, the Philippines, and Egypt, the latter forming the largest expatriate community. Language: Arabic remains the predominant language in Bahrain though English, Hindi and Urdu are also widely spoken. Hence, expatriates usually do not face any difficulty in communicating with colleagues at work or in their local communities. English is the operating language at Bapco although Arabic is widely spoken too. Dress: While it is common to see the local and Muslim population in national dress, expatriate men and women need only dress modestly in public. This means women do not have to cover their head, face or hair with a scarf but they must be respectfully covered from the shoulders to the knees. Healthcare: Specialized medical services and procedures are readily available in Bahrain. The Kingdom’s healthcare infrastructure is on par with the best in the world, with options for treatment in the public and private sectors. While citizens enjoy free health care, expatriates may also use subsidized medical facilities at state-funded hospitals. In particular, the Company’s Awali Hospital in the Awali Township serves the needs of Bapco employees and their dependents. Click here for a list of hospitals in Bahrain. Transportation: The two popular forms of public transport used in Bahrain are buses and call taxis. Many expatriates prefer to drive their own vehicles, while those without a license use hail taxis or on demand taxi like Uber to get around. Air conditioned and comfortable buses are also available at an affordable price. Most expatriates will find the petrol prices low which is a reason enough to own a vehicle of their choice. Click here for Bahrain Transport Authority website. Social Clubs: Specilaist societies and clubs are an integral part of the expatriate community in Bahrain and an ideal meeting grounds for people with shared interests and backgrounds. They provide that comforting feeling of a home-away-from home and cater to a wide variety of interests including sports, culture, arts or personal development. Click here for a list of social clubs in Bahrain.